From 26-30 June 2018, the Brazilian Association of Art Critics, ABCA, the Brazilian chapter of AICA, held an international seminar: Concrete Art and Constructive Dimensions: Theory, Criticism and History of Art and Technique, in partnership with the Conservation Science Laboratory of the Fine Arts School of the University of Minas Gerais – LACICOR. This event aimed to discuss and to bring international recognition to the many singular approaches and possibilities in artistic production in Latin America in the context of modern art in the 20th Century. We began from the belief that by articulating these histories in one single event we can form a transdisciplinary view that enriches and problematizes our approach. The Seminar had the support of the Federal University Of Minas Gerais, CAPES and the Getty Foundation and gathered researchers from different regions of Brazil, Argentina, Chile and United States. The coordinators of the event were Luiz A. C. Souza, Yacy-Ara Froner e Alessandra Rosado from LACICOR and Maria Amelia Bulhões, Marilia Andrés Ribeiro and Claudia Fazzolari from ABCA. Those present included the International President of AICA, Lisbeth Rebollo Gonçalves, Jeanne-Marie Teutonico, Associate Director of the Getty Conservation Institute –GCI, Andrew Perchuk, Deputy Director of the Getty Research Institute – GRI, Cory Rogge from the Houston Museum of Fine Arts, Aleca Le Blanc, from the University of California Riverside, Ana Morales and Fernando Marte, both from the National University of San Martin, Argentina, as well as such important Brazilian researchers as Aracy Amaral, Anna Maria Belluzzo, Luiz Camilo Osório, Maria Lucia Kern, Marilia Andrés Ribeiro, Tadeu Chiarelli, Yacy-Ara Froner, Luiz Souza, among others. The conference was opened by Mari Carmen Ramirez, curator of Latin American Art and Director of the International Center for the Arts of Americas, at the Houston Museum of Fine Arts. The texts of the conferences and papers are available on ABCA website (abca.art.br/httpdoc/ebooks-abca), as an e-book published by ABCA, registered with the National System of Libraries. Throughout five intense and productive days, it was possible to confirm our initial conviction about the importance of these interlocutions, with all the participants expressing how enriching and high level the debate was, because of this more complex approach, in line with contemporary thinking. 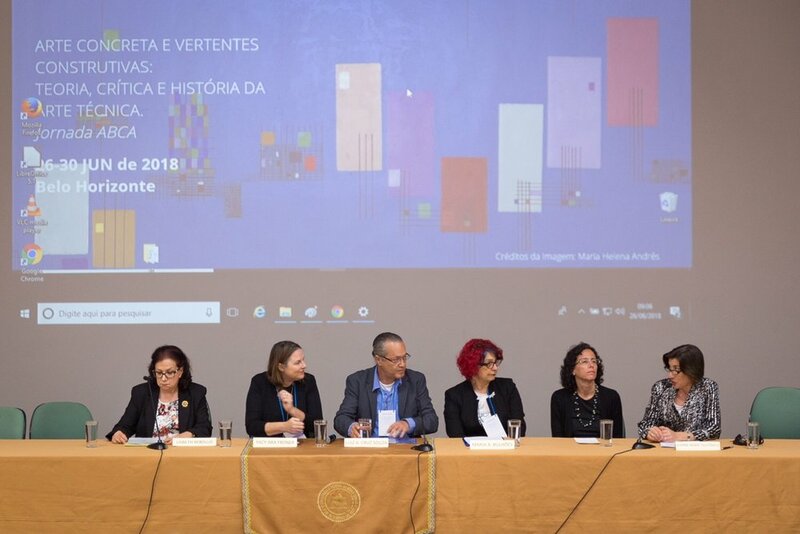 The Brazilian chapter of AICA has assumed an important role in national academic debate, holding events which address relevant themes that attract the participation of highly regarded scholars in the visual arts in the country. The international coverage and plurality of approaches of this seminar has raised the bar of these activities.